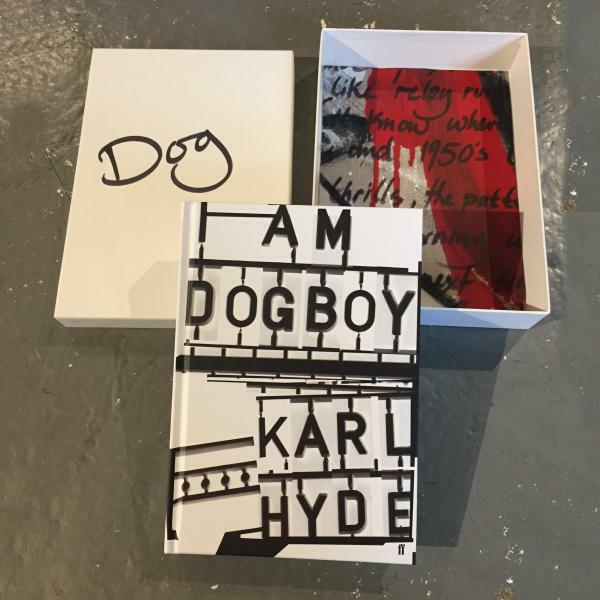 'I Am Dogboy' by Karl Hyde, a book of diaries, autobiographical narrative, photographs & abstract poetic pieces. In 1999, Karl began writing a public diary. Every day since then, he has documented his thoughts, lyrical works-in-progress, poetry and biographical essays alongside 'found' visuals. For the last sixteen years, these entries have collectively created an on-going, utterly unique monologue on underworldlive.com. ‘I Am Dogboy’ by Karl Hyde, is beautifully designed by John Warwicker - Hyde's long time collaborator and co-founder of the tomato collective. Karl Hyde and John Warwicker have previously published the typographic books ‘Mmm... Skyscraper I Love You’ and ‘In The Belly of Saint Paul’. In the Belly of St Paul by Karl Hyde & John Warwicker Printed in 2003, with a special limited edition run of 2000, "In The Berry of St Paul" is a typographic journal through London by night, documenting Hyde's personal experiences, memories and overheard conversations as he trawled backstreets & alleys gathering words to be used by Underworld.